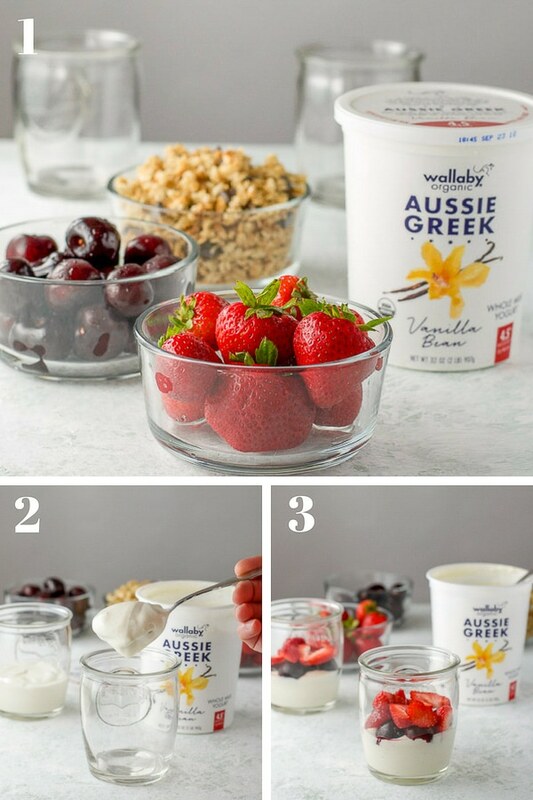 This yogurt parfait features delicious layers of vanilla bean Wallaby Organic Aussie Style yogurt, flavorful fruit and crunchy granola. It has a lovely taste and is such a treat to have at breakfast or for dessert. 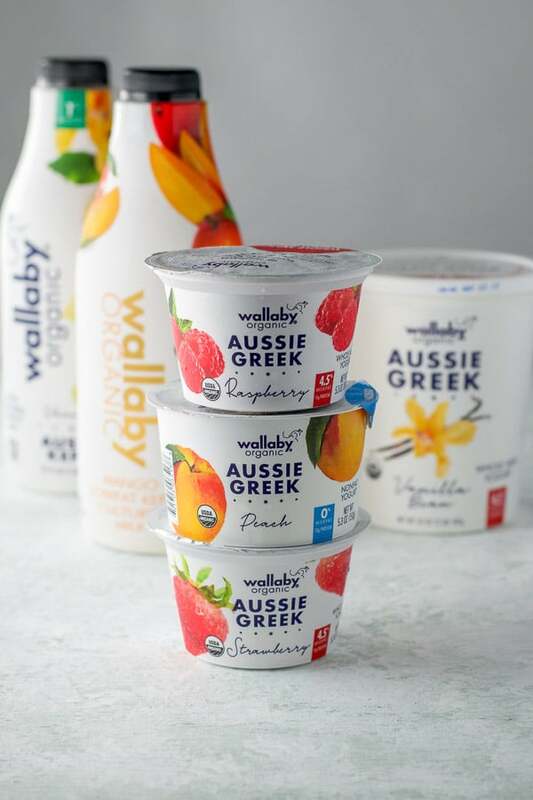 When I discovered the opportunity to write a blog post about Wallaby Organic Yogurt, I was beyond thrilled. I’ve been eating their yogurt for years! 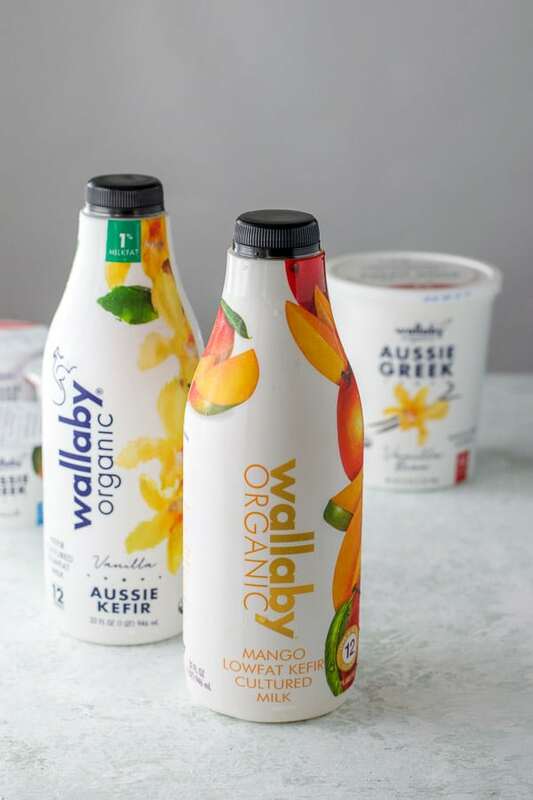 The owners of Wallaby yogurt started their company way back in 1996 (you can read about their product and methods here) and I can safely say I’ve been eating it just about every day for more than 10 years. That’s how much I love it. You will find it has a taste that is uniquely mellow among yogurts. Here is a coupon for $1.00 off three 5.3 ounce tubs of Aussie Greek! Here is a photo of all the Wallaby Organic Aussie Style products I found at my local Whole Foods, a perfect place to buy them. I got 3, 5.3 ounce tubs of the Wallaby Organic Aussie Greek yogurt in three different flavors. The strawberry and raspberry (whole milk) are pre-mixed but the peach (nonfat) has a little side pocket of peachy goodness! Drool. 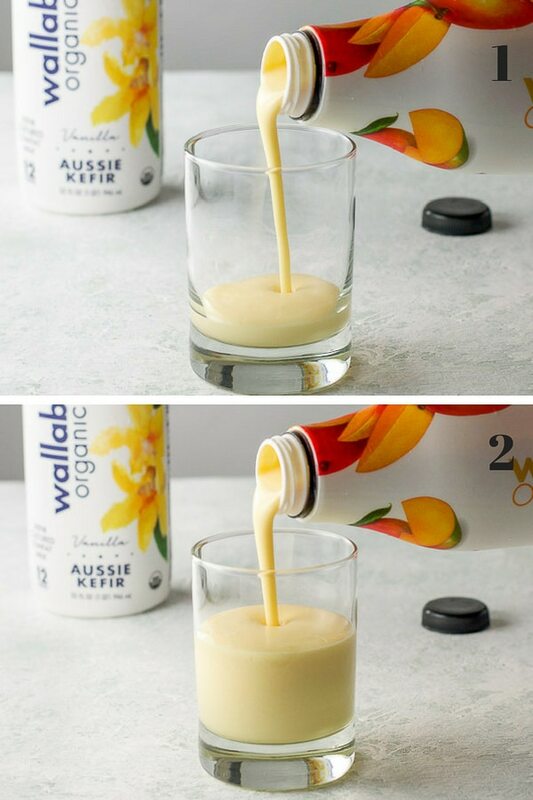 Over the years, I have tasted my fair share of kefirs, but when I noticed Wallaby had an organic Aussie style kefir (it comes in whole milk and lowfat flavors), I exclaimed out loud in the store, causing a few furtive glances to be directed my way. For this post, I chose vanilla (which I’ve tasted before) and mango, which was new to me. I screeched for Christopher to come try the mango kefir. But before he did, I needed a few pour shots. For this yogurt parfait recipe, I decided to use the vanilla bean Aussie Greek yogurt. Use organic fruit and granola whenever you can because there is a taste difference. All that is left to these yogurt parfaits is to sprinkle more granola on top. I hope you enjoyed this yogurt parfait recipe! Do yourself a flavor and try the Wallaby Organic Greek Yogurt and Kefir. You won’t be disappointed. You’ll be thanking me for introducing you to this awesome brand. Here’s a coupon to make your transition to this delightful yogurt easier! 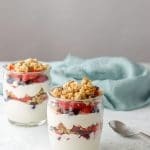 If you’ve tried this yogurt parfait or any other recipe on the blog, I’d love the hear what you thought about it in the comments below. I love hearing from you! You can also FOLLOW ME on FACEBOOK, TWITTER, INSTAGRAM and PINTEREST to see more of my delicious food and delightful cocktails! This yogurt parfait is easy to layer and delicious to eat and can be on the table in 5 minutes! When I make this, I don't measure out the ingredients, this is a rough measure. I dollop the yogurt in the glass and eyeball how much I want. I believe I used close to a cup of yogurt in each parfait. This fruit and yogurt parfait looks beautiful. I think you are right it could be eaten for breakfast or dessert! Totally yum! Thanks Jacqueline! I love the combination any time of the day! What a perfect breakfast! I love the contrasting textures and beautiful layers! Thanks Allison! I appreciate it! This parfait is one of my favourite breakfast combination! So easy yet so delicious! Really love the look of those creamy yoghurts, I wish I could get hold of them in the UK! Thank you Tania! It’s amazing to me that the yogurt I used was Greek yogurt! It was so creamy! I’m always up for a yogurt parfait! This looks amazing! I love yogurt parfaits! This looks like an easy and delicious recipe. Can’t wait to try it because I love how light and fresh parfaits are. Delicious!! Thanks Joanna! It’s so easy and delicious! Thanks Gabi! 🙂 I love it too, and it’s fabulous with blueberries too! This looks like dessert for breakfast. You can never go wrong with that. I don’t think we have that brand in Canada, but it does sound great. I love when healthy is so easy and delicious. I think my grandkids would love this for their school lunch too. I bet they would too Gloria! It’s a fabulous brand for sure! Thanks Dawn, I’ve been eating their yogurt for over 10 years. I used to eat the chocolate on the bottom flavor but couldn’t find it again when I moved. But I love all their flavors but am very fond of the vanilla bean. And the kefir – mango all the way! This yogurt parfait sounds amazing! Also, that vanilla chocolate chip granola sounds so good!! Did you make it yourself? Thanks so much Cathleen! Yes, I did make it myself but I’ve got to post about it. Not sure why I haven’t yet! Yogurt parfait is looking great. Looking so colorful and yummy. Thanks for the nice recipe. Thank you Silpa! I appreciate it. Super valuable post! I’ve not heard of this brand of yogurt but I’m all over it now! Thank you so much for this information!! Can’t wait to give this recipe a try!! Thanks Amanda! I do think it is such a good yogurt! Simple and so delicious! 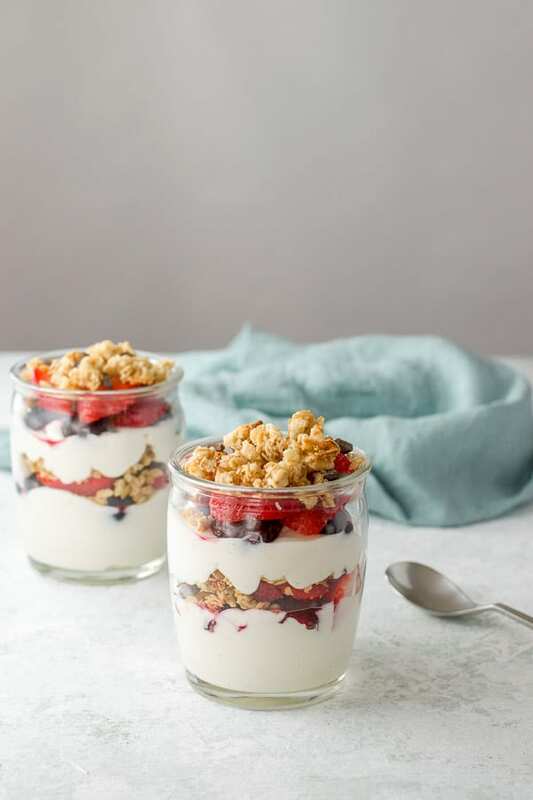 These yogurt parfaits are great for a breakfast or a dessert. okay, a snack too! Just love how easy they are to put together. The kefir, oh my love it! Hehe Eileen! I can eat this parfait any time of the day! The perfect breakfast for busy mornings since it whips up in less than 5 minutes! It’s also packed full of good stuff that’s perfect to fuel you through the day. These look great! Yoghurt and granola is always a winning combo and this is so beautifully put together. Thank you Emily! I appreciate it! I could literally eat this for breakfast every day!! And I haven’t tried Wallaby yet so thanks for the coupon!!! Thanks Lorie! I hope you can find this yogurt. It is so delicious! Yay for another Wallaby fan! Thanks for your comment Veronika! I love how easy this recipe is! 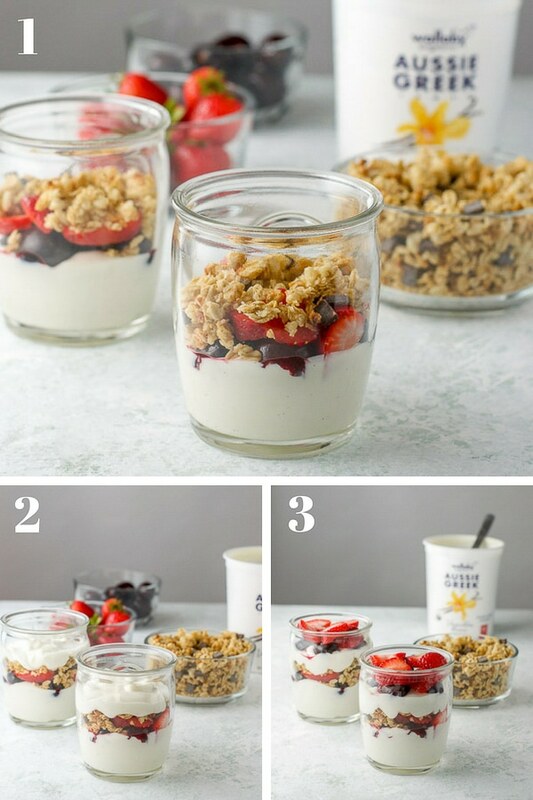 These yogurt parfaits are perfect for an easy breakfast or even dessert – yum! Thanks Holly! And I agree – breakfast or dessert! These are gorgeous and sound absolutely delicious! I’m always looking for healthy, delicious breakfasts so I’m definitely going to have to try this. I love granola and yogurt partfaits for breakfast! Although this post makes me feel like my family has defective tastebuds — we have done blind taste tests of organic vs nonorganic fruit and have never been able to taste a difference. We do love buying local from the farmers market, though! I don’t think you have defective taste buds. I think it’s because I’ve been eating organic for so long, I can tell when it isn’t. Thanks for your comment, Julie! I will be saving this breakfast idea for next week. I have already been to the grocery store this week, but I will be starting my days with this very soon. Thanks Jacque! It is so delicious! !